Politics is no longer an idea whose cogitation stemmed the directions society benefited from venturing into. The trend persists almost around the world. Now it is a framework. Ideas take root and evolve. Frameworks remain same. The drops of unctuousness that rain from clouds of ego and negative materialism corrode it. Indian politics once had only been on its way to becoming a framework. Today it seems to have even surpassed the rigidity and corrosion laden iron coves of this framework. Big mouths don’t speak much but devour well. Playing underhand is the art Indian politicos have perfected over the years. The alcoves at the right places have the right haunch markers. The habits of being upfront, apparent, honest and direct are in dissonance with these alcoves marked for a thickness tinged with scabies. Murky rough and tumble of Indian politics is pregnant with ooze which is xenophobic. Smirk and snigger work more effectively than a smile. Whiteness of khaadi cloaks the grime. Former and later form a combination one needs to be familiarized with before stepping on to concrete floor of politics that loathes the idea of fertilization of floral attributes. After all today’s seeds are tomorrow’s trees. What if their shadows take away some of the acute whiteness of the acicular sun Indian weather is afflicted with? The avalanche of television journalism, if we can still use this term, taught new lessons to our journalists or shall we say ‘story’ diggers and business honchos who pay them. Unfortunately lessons got entwined with lust. Trivia is sturdy and centre is too dark to be cast light upon. After all ‘exciting’ is the key word. If a beautiful lady is part of some story what else we need. To hell with every thing else. Feed eyes and ears and relish the salacious pelf-morsel in return. Human beings are objects. After medieval kings contemporary politics and journalism again tells us that. It hasn’t happened for the first time. Shashi Tharoor is only the latest and perhaps most pleasure giving scapegoat. The keyword brings the mullah. Let news play second fiddle to key word. Hook lines can stray and then startle. 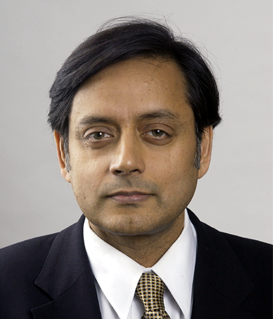 Mr. Tharoor, at fifty four, must have had a change of DNA, ‘if it is possible’, to facilitate the transformation. From being one of the brightest stars in international affairs and literary world to being a speck in the eyes of Congress. From being an articulate speaker to a helpless groveller. Likewise Mr. Modi, too, must have gone to the doctor of equal skills to lend himself the skin of a crusader for transparency overnight. What if only for one particular franchise, for first time in three years, notwithstanding the sweep that his family splays over Rajasthan Royals, strangely the cheapest franchise, Kings Eleven and other IPL operations. Mr. Tharoor is an MP too, from Trivendrum in Kerala apart from being a minister. Did someone tell us about it of late? He is an avid cricket lover to the extent of having penned a book on cricket in partnership with Shaharyar Khan, former chairman of Pakistan Cricket Board, called ‘Shadows Across The Playing Field.’ And top of it he had always considered IPL to be nothing short of a brand ambassador for Indian cricket and its resounding economy, for all the flaws of IPL as well as economy. If he wanted his home state to have an IPL cricket team of its own which of course would bring Kerala into the mainstream of Indian consciousness from periphery, bringing along all the benefits, economic as well as social, anything wrong in it is not discernible for unprejudiced eyes. But problems begin here. A lady he is close to was given a free equity worth seventy crores called ‘sweat equity’ in lieu of the services she would render to the franchise owing to her puported vast and long entrepreneurial and professional experience in her own right. Is it legal? Did Mr. Tharoor charge something most probably in the form of the equity for his friend for ‘mentoring’ Kochi franchise? Even the dumbest politician today in the age of stings and twenty four hour TV won???? ?t indulge in such ‘direct’ corruption. I wish Mr. Tharoor come clean. The suggestion that Mr. Tharoor abused his office of external affairs to have this deal of ‘free booty’ as alleged by BJP come through for Sunanda Pushkar, the lady in the center of controversy, holds only as much water as does the idea of Indian politics free of corruption. If Mr. Tharoor was holding any other office the accusation, though still wrong considering Mr. Tharoor’s credentials, could have had an air of plausibility about it. But given his now proved proximity to Kochi franchise which in itself is innocuous will he be able to establish his aloofness from the matters relating with equity with conviction is a question waiting to be answered. The reports that Mr. Modi had requested external affairs ministry to deny visa to a South African model Gabriella Demetriades who quite interestingly according to a newspaper report had been quoted as saying, “He (Modi) is a friend. We met during last year’s IPL in South Africa” tilts the balance in favour of Mr. Tharoor. The request was not obliged. If the request had been obliged that would have been the abuse of office, a misdeed politicians often do. Who knows if this ‘non abuse’ was partially responsible for bringing the situation to this pass? After all we live in the world of favours. One’s ‘abuse’ is ‘Ablution’ of other. The floating about of some more ‘invincible’ powerful names in connection with non existent IPL teams swings the tide further. Now what remains to be seen is where does this whirl of abuse of office unleashed by BJP stop. Still any suggestion regarding Mr. Tharoor’s involvement in ensuring what his friend got will have to be ripped apart by Mr. Tharoor to come out of this imbroglio unscathed. Mr. Tharoor who served for close to thirty years in UN in important capacities without any taint or having even an ounce of his integrity marred today finds himself being crucified for being politically naïve depending upon one’s understanding of what is politically adroit and for having refused to cut his size to fit himself into the alcoves of Indian politics. As a writer of fiction and non fiction he dealt with traditions and cultures of his land through the prism of history, satire and critique. As a politician he only compounded the matters by letting the prism of distance and ego that he has had to brave so often intrude into his own distance from what he is part of. But he can’t be blamed for that if he hasn’t done anything wrong. If he has he can’t get away. Today entire country is bearing witness to his being traduced and pilloried by someone with cloudy comportment with full backing of a particular political party which considers no one less than Lord Rama as its charioteer. One hopes Mr. Tharoor’s directness hasn’t had any infringement on his honesty. Though the political ambiance he has embraced makes these two traits together constitute a lethal combo. To think that money drove him to India and its politics is akin to insulting even the faintest aspiration of every honest man to serve his country in one way or another. If we set this controversy aside we will acknowledge that Mr. Tharoor has had to put up with a continuous snide torrent right from his entry into Indian politics. Mr. Tharoor was called preposterous names when he began to tweet as if it were nothing short of a plunging into scandal. Today many do. The initiative to be frank with people was scoffed at by the same media which pretends to be a warrior for the cause of transparency. Crusaders of justice in Indian politics accused him of being haughty. His English was made fun of by those whose hectoring tones on national television leave the audience and participants frustrated in equal measure. He was accused of promoting his works. His personal relationship was relegated to a loosely woven and morally degraded headline. Most importantly he was never discussed in the media for even an ounce of work he may have done as the minister. Ironically some angles of his act of trying to bring cricket to Kerala as an MP became the most potent threat to his ministership and more importantly his most prized possession, his integrity. Mr. Tharoor has committed mistakes but it also appears that Mr. Tharoor is proving to be an indigestible sight for politicians and media alike of a certain hue which unfortunately covers a substantial part of the picture. The tongue of Indian politics has been undergoing change of taste for a long time. Now swinish taste of words is norm. Yellow teeth, an exhibition. And smirk meets smirk. The words of Mr. Tharoor, however familiar but slightly in different accent, are unfamiliar to it.